President Tran Dai Quang and his Russian counterpart Vladimir Putin on Thursday expressed particular interest in strengthening commercial co-operation, agreeing on investing more than US$10 billion in either country. At a joint press conference following talks between the two leaders in Moscow, the two leaders announced that the investment would be poured into 20 priority projects, including a joint Vietnamese-Russian oil and gas enterprise, the construction of a light industrial zone in Moscow and projects carried out by Vietnamese dairy group TH in some Russian localities. Another $500 million would be spent on projects with high potentials in new areas of bilateral co-operation like agriculture or medicinal herbs, the leaders said. The two countries have also set an ambitious target of bilateral trade reaching $10 billion by 2020. Oil and gas will remain the top priority sector for co-operation between the two countries, Putin said. Putin said Russia was committed to providing Vietnam with cooking gas, petrol and other fuels. He also said Russian enterprises were more than ready to lend a hand in modernising Vietnam’s power plants and and help the country build new power plants. The two leaders also agreed to co-ordinate closely with each other in implementing the Vietnam -Eurasia Economic Union Free Trade Agreement in order to fully exploit its advantages for further co-operation in trade and investment. 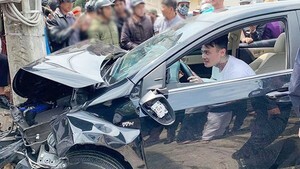 Joint ventures to assemble and produce cars in Vietnam will soon be set up and co-operation stepped up in energy and infrastructure. The leaders said they will also consider the potential for continuing co-operation in the use of nuclear power for peaceful purposes. On the East Sea (South China Sea) dispute, Quang and Putin agreed that any border or territorial dispute should be resolved by peaceful means without resorting to the threat or use of force, in accordance with international laws including the United Nations Convention on the Law of the Sea 1982 (UNCLOS). They agreed the Declaration of Conduct in the South China Sea (DOC) should be implemented fully and effectively, and hoped that the South China Sea Code of Conduct (COC) will soon be completed. President Putin affirmed that Vietnam would always be a priority partner for Russia in the Asia-Pacific region. He said he believed that Quang’s visit will provide fresh impetus to the development of the bilateral ties in the coming time. Quang reiterated that Vietnam has consistently prioritised strengthening of the comprehensive strategic partnership with Russia in order to promote further bilateral co-operation in all fields. The two leaders later witnessed the signing ceremonies for several co-operation projects including the building of a nuclear technology and science centre in Vietnam between the Vietnamese Ministry of Science and Technology and the Russian Rosatom Group, a co-operation agreement on anti-money laundering between the State Bank of Vietnam and the Financial Market Relations Regulation Centre, and another between the Vietnam News Agency and the Sputnik. A memorandum on technical co-operation between the two State treasuries was also signed in the presence of the presidents. A 2017-22 co-operation programme in aerospace technology between the Vietnam Academy of Science and Technology and the Roscosmos State Corporation for Space Activities and an agreement between the Vietnam Railways Corporation and the Russian Railways Open Joint Stock Company were also signed on Thursday. 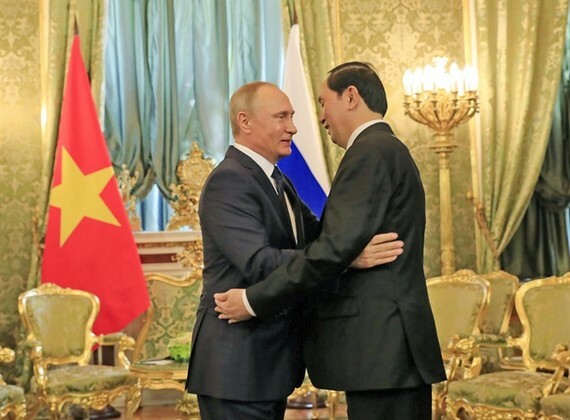 Vietnam treasures its comprehensive strategic partnership with Russia and consistently prioritises the development of bilateral relations to make it more sustainable and effective, President Tran Dai Quang said on Thursday. Meeting with Russian Prime Minister Dmitry Medvedev in Moscow as part of his ongoing four-day official visit to Russia, the President said that Vietnam sees Russia as one of its top important and reliable partners. He highlighted the strong political ties between the two countries as well as co-ordination between the Vietnam Communist Party and the United Russia Party led by PM Medvedev. Quang said he was delighted at visiting Russia for the first time since he took office in 2016. His noted with pleasure that his visit also coincided the 100th anniversary of Russia’s October Revolution. President Quang and PM Medvedev expressed their “high determination” to lift the comprehensive strategic partnership between the two countries to new heights. They also agreed on measures to promote and deepen bilateral ties. The Vietnamese President proposed that the two governments foster co-operation with effective implementation of the Vietnam -Eurasia Economic Union free trade agreement, and by creating favourable conditions for import-export activities between the two countries. Both sides should encourage co-operation projects, especially in oil and gas, energy, automobile assembly and production, and milch cow breeding and milk processing, he suggested. He thanked Russia for supporting the Vietnamese community in Russia, and pledged Vietnam’s assistance in the organisation of the Russian Culture Days in Vietnam this year. For his part, the Russian PM expressed his fond sentiments for Vietnam, and recalled memories of earlier visits to the country. Medvedev noted that bilateral ties have grown in all fields, especially economy and trade, and said he hoped both governments will continue their focus on bolstering trade and investment ties. He suggested that the two sides actively seek more co-operation projects. The leaders expressed pleasures at the close co-ordination between Việt Nam and Russia at multilateral forums, including the APEC. Medvedev said Russia was willing to work with Việt Nam in successfully organising APEC Year 2017. Earlier the same day, President Quang and the Vietnamese delegation laid flowers at the Hồ Chí Minh Statue in Moscow and planted a tree in Hồ Chí Minh Square. They also laid a wreath at the monument in the Red Square commemorating unknown martyrs who died between 1941 and 1945, and paid tributes to the Russian revolutionary leader Vladimir I. Lenin.